THE Glenora Milo In2Cricket group held its final session for the year at Gretna last Friday afternoon. After their session the kids enjoyed a barbecue and the presentation of goodies and a medal each. To cap off the day they watched the T20 Blast participants in action. 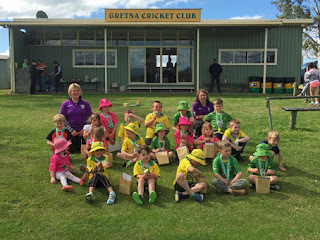 Co-ordinator Annie McKenzie thanked all the youngsters for attending during the seven-week program, as well as helpers Tash Farrow and Peter and Finn Roberts who were a great help. Sorell 3/129 off 30 overs d. Gretna 9/78 off 19 overs at Sorell No.1. Batting: Aidan Featherstone 26 (6x4s), Bailey Wheeler 22 (1x4), Connor Gittus 8 (1x4). Bowling: Connor Gittus 1-6 (3), Kane Lovell 1-7 (3). Clarence Maroon 5/145 off 30 overs d. New Norfolk 7/101 off 29 overs at Boyer Oval. Batting: Tom Murray 26 (3x4s), Cameron McMaster 16 (2x4s), Tate Browning 12 (1x4). Bowling: Cameron McMaster 1-10 (3), Josh Cantrell 1-14 (4), Bobby Nossiter 1-24 (4). New Norfolk 8/140 off 27.2 overs d. Brighton Blue 8/135 off 33 overs at Thompson Oval. Batting: Jordan George 55no (5x4s, 1x6), Jack Gordon 27 (2x4s, 1x6), Jorden Gittus 14 (1x4). Bowling: Dylan Browning 3-6 (5), Jordan Gittus 3-12 (4), Zayde Hill 1-14 (4), Jake Stevenson 1-18 (4). A special mention goes to New Norfolk's Jordan George who batted very well to make a half-century of 55 not out. Jordan's innings included five fours and one six. Well done also to Jordan's team mates Dylan Browning who took 3 for 6 off five overs and Jordan Gittus 3 for 12 off four overs. Excellent bowling boys. Gretna v Lindisfarne at Gretna. New Norfolk v Wellington at Collinsvale Oval. Gretna v St Anne's Crows at Gretna - 12.15pm start. New Norfolk v Glenorchy Magpies at Boyer Oval - 9am start.